Fog Over Frisco - Find The Killer! With Val missing, the search for Arlene's killer becomes even more urgent. When a will from Arlene is found all are astonished to learn that she had all along been secretly married, to an Arthur Burchard. Her father remembers the name and that he came from Los Angeles. The manhunt turns to Burchard. Then ... Burchard it seemed owned a small yacht and the search now concentrates on scouring the waterways for it. For these shots, locations in Los Angeles and in San Francisco were used. This one shows a Douglas Dolphin flying boat leaving its embarkation dock within the Los Angeles Harbor's Slip No. 5. ... in 1938 ... here's a vintage photo of that same flying boat at the dock; it was right next to the Wilmington Catalina Terminal (map). Instead of taking a ferry boat from the terminal, the well-heeled could fly to Catalina Island for the $5 fare advertised below. (That's a different building seen above across the slip). ... and Now, the terminal building is gone and this corner of today's Slip No. 5 has become very industrialized. 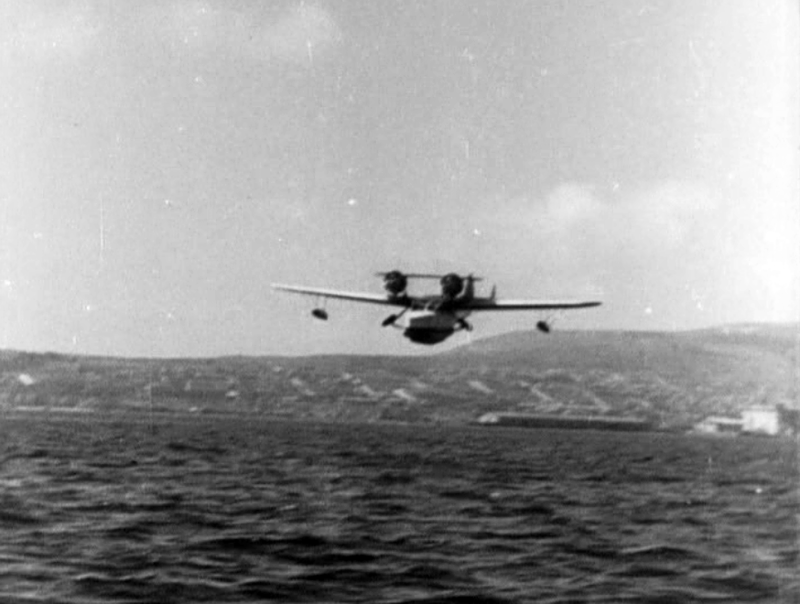 Then ... the flying boat continues searching off the coast. ... and Now, the coastline is that of San Pedro with the Palos Verdes Hills in the background. 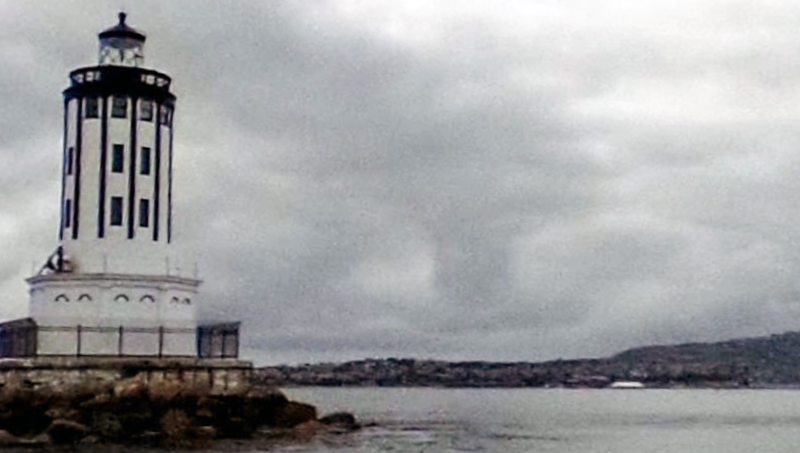 The fly-by above was probably filmed from the Los Angeles Harbor lighthouse perched at the end of a long breakwater (map); this recent photo of it shows the same coastline. 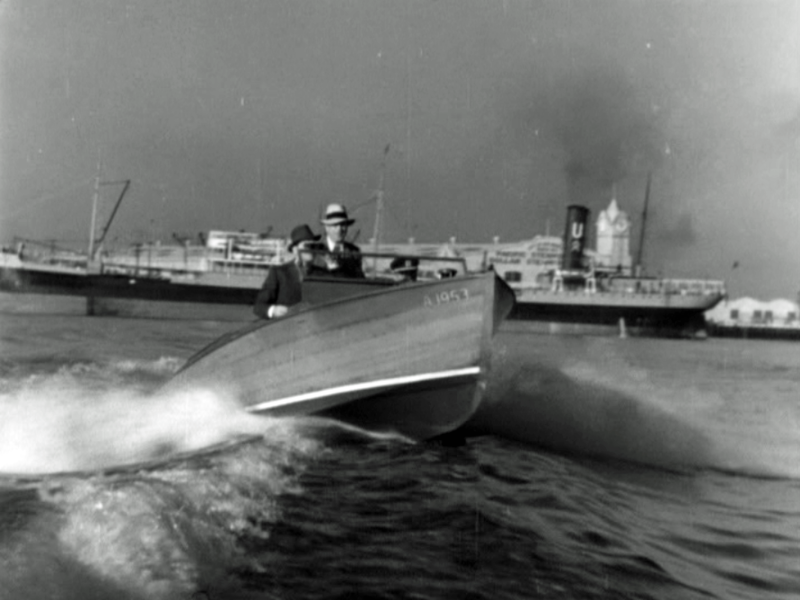 Then ... Tony too joins the search for Burchard's boat in the Los Angeles Harbor. The harbor's distinctive clock tower can be seen across the Turning Basin towards the right beyond the ship's smokestack. ... c 1920 ... this early photo captured the 1917 cruise terminal and clock tower in its glory days. They were demolished in the late 1940s. 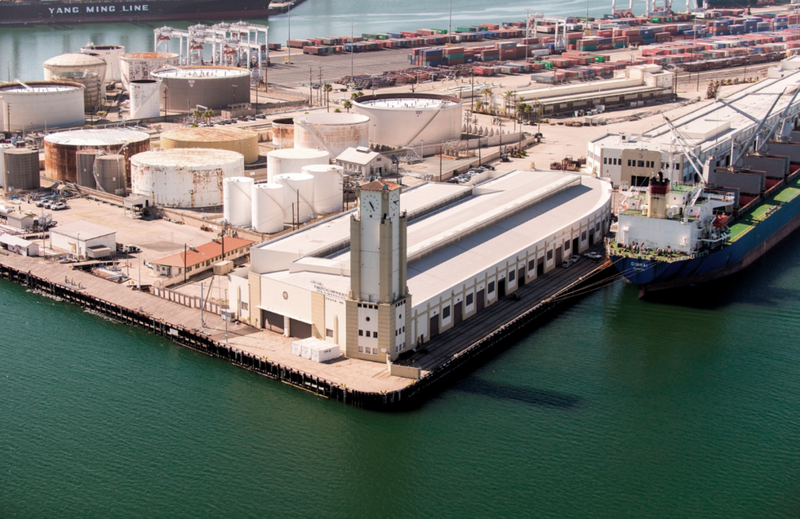 ... and Now, the cruise terminal and clock tower were rebuilt in expanded form in 1963; here it is today (map). This 1956 photo of the Los Angeles Harbor highlights the locations seen during the search for the killer. Then ... 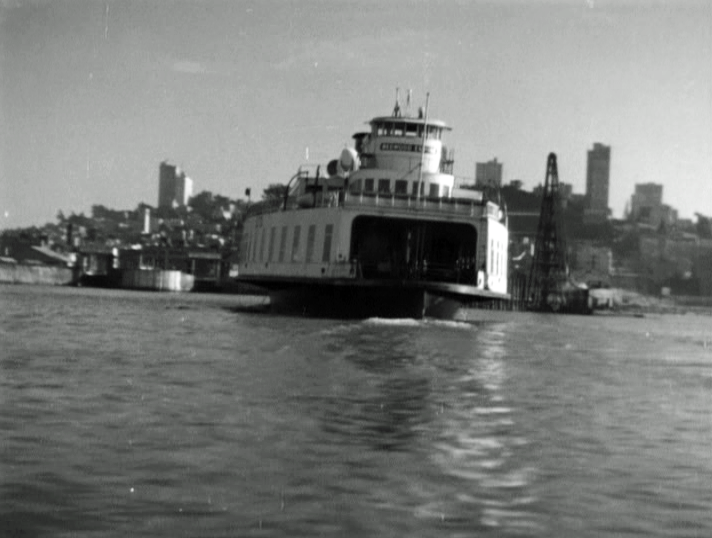 The search continues but this time stock footage was used of two ferryboats in San Francisco Bay - the first is close to the Ferry Building. ... and Now, this is the Southern Pacific Railroads' ferryboat 'Berkeley' which operated between the Oakland Pier and the Ferry Building from 1898 to 1958. After a spell as a tourist mall moored in Sausalito (where it was briefly seen in the 1972 movie 'Play It Again Sam'), it ended up in the San Diego Maritime Museum, still there between two other historic vessels. Then ... Another ferryboat is seen off Hyde Street Pier where Russian Hill in the background climbs halfway to the stars. 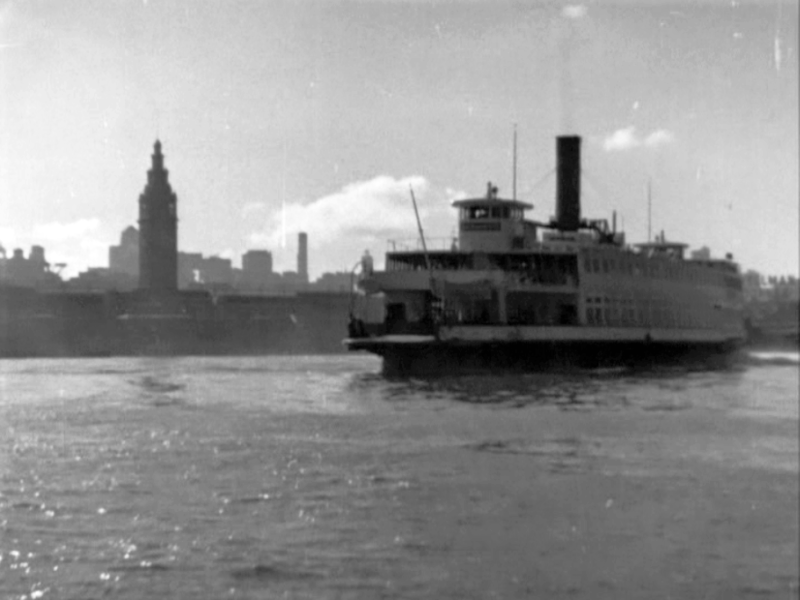 ... in 1935 ... one year before Fog Over Frisco was released this same ferryboat was photographed passing by the partially constructed Bay Bridge. It's the Southern Pacific Golden Gate Ferries 'Lake Tahoe'. Later the boat was moved to Puget Sound and renamed the 'Illahee' where it operated until retirement in 2007. It is currently awaiting the scrap merchant. Tony succeeds in finding Burchard's boat and rescues Val. What he learns blows the lid off the case. It turns out that Burchard and Arlene's 'secret lover' Mayard are one and the same person; he it was who killed Arlene in an argument over letters she had written that implicated him in the stolen bond scheme. Tony returns and tips off the police ... they finally get their man.